How do you feel about paying $20 for a cocktail? Check off all that apply to you. 1 You’ve complained about public transport. 2 You’ve paid more than $4 for a coffee. 3 You’ve called someone from Melbourne a hipster. 4 You’ve been to Messina. 5 You try not to cross the Harbour Bridge if you can avoid it. 6 Your rent is at least half your weekly salary. 7 You’ve had a messy night out on Oxford st.
8 You’ve had a messy night out in Kings Cross. 9 You’ve had a messy night out in Newtown. 10 You’ve eaten a kebab or Maccas at 3am. 11 You think Wollongong is the country. 12 You’ve taken advantage of the $3.50 drinks at Star Bar. 13 You still call The Star, ‘Star City’. 15 And you judge them on it. 16 You’ve read “Looking For Alibrandi”. 17 You’ve spent thirty minutes stuck in traffic on King Street in Newtown. 18 You went to a concert at Allphones Arena when it was the Superdome. 19 You know it’s a scallop, not a potato cake. 20 You’ve purposely avoided George street at 5pm on a weekday. 21 You’ve purposely avoided Darling Harbour on a Sunday. 22 You have a favourite Newtown Thai place. 23 You know that there’s always a chance of rain even if it’s completely sunny. 24 You’ve caught the 333. 25 And you know what this means: “You know me, I’m on the 333”. 26 You know to avoid anywhere near the harbour on NYE. 27 You’ve had a pie from Harry’s Cafe De Wheels. 28 You don’t 100% understand the rules of AFL but you know the Swans’ team colours. 29 You’ve been to Big Day Out at least once. 30 You went to the 2000 Olympics. 31 You’re sick of Jacarandas. 32 You’ve given up on the idea of ever owning a house. 33 You’re not too disgusted by cockroaches anymore. 34 You’ve Instagrammed a photo of the view from the giraffe enclosure at Taronga Zoo. 35 You’ve gone to a Surry Hills cafe and Instagrammed your meal. 36 You’ve cursed the fact that the Eastern Suburbs train line doesn’t run all the way to the beach. 37 You’ve gotten lost in Westfield Bondi Junction. 38 You’ve entered the City 2 Surf. 39 You’ve spent way too much money at the Easter Show. 40 You can justify spending $10 on a sandwich. 41 And $7 on a juice. 42 In summer, you avoid Bondi Beach like the plague. 43 You’ve spent a boozy afternoon at a pub overlooking the beach. 44 You’ll never get over the ferry ride to Manly. 45 You’ve given up complaining about parking rates. 46 You know where The Hills is but you’ve probably never been, unless you live there. 47 You’ve been to a gig at the Enmore. 48 You’ve spent a night battling crowds at Vivid. 49 You’ve paid $20 for a cocktail. 50 You watched someone juggle knives at Darling Harbour. 51 You’ve yelled at someone whilst driving. You’re probably not even Australian, right? Eh, maybe you’ve visited the city once or twice but you’re certainly not ‘Sydney’. You’ve definitely never had a kale smoothie. Hmmm you’re a little bit ‘Sydney’ but you’re probably more Newcastle to be honest. Sorry. YAS! 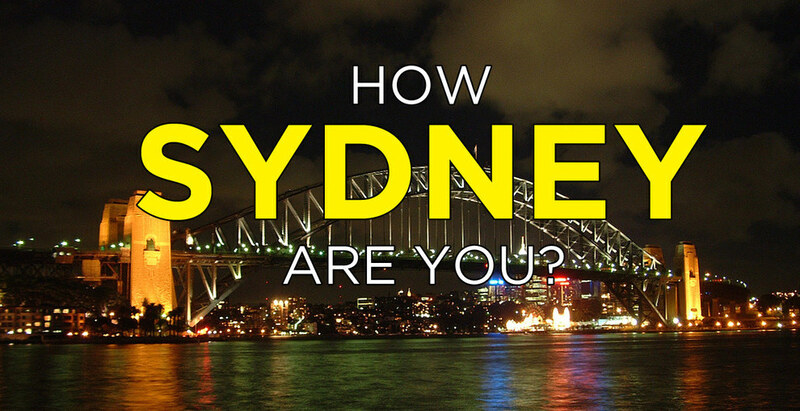 You’re definitely a Sydneysider! You probably had cold drip coffee and organic chia toast for breakfast.